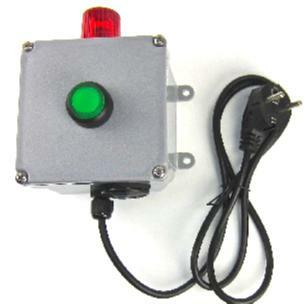 The Wall Mount Power Failure Alarm alarms with loud buzzer and flashing LED. Always on duty – ultra-low power consumption allows Lithium battery to last for 10 years or more. Very loud alarm. 103dB! Irregular warbling pattern cuts through factory noise. Silence button with “snooze alarm” setting. Low Battery alarm. If the battery runs low, the Power Fail Alarm beeps and flashes to let you know. Bright flashing beacon LED. Bright enough to be visible in daylight. The wall mounted power fail alarms continuously monitor AC power outlets and if there is a power interruption, the LED flashes and a 103dB buzzer sounds. The buzzer can be silenced with the front button. Simple installation, just snap in the (included) long-life lithium battery. After that you are protected for the next 10 years. A selectable “snooze alarm” feature will cause the alarm to come back every 30 minutes until power is restored. Will alarm for 50 hours straight with the supplied Lithium battery. 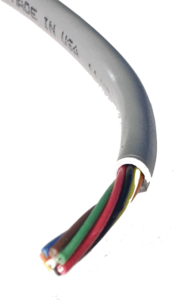 Flexible logic so it can detect millisecond blips, (useful for computer equipment) or only report power outages longer than 10 seconds. Optional mode for a 15-minute delay for either the audible alarm or auxiliary output. 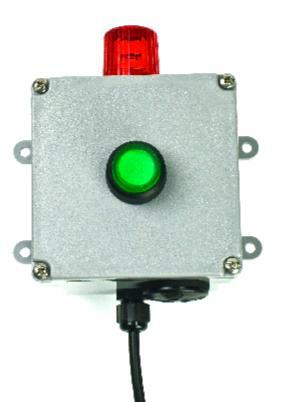 Very loud beeping audio buzzer – 103dB at 2 ft will never be missed even in noisy factories. Extremely low power consumption allows the lithium battery (included) to last up to 10 years. If battery power is low due to excessive alarming time, a low-battery warning alarm sounds for many weeks. Relay output provides a contact close or open to trigger an autodialer, building alarm system, or other remote device. Output is maintained for the duration of the power failure. Weatherproof box is rated IP65. Comes with 10 foot (3m) rubber jacketed SJOOW power cord. Specify the length needed to connect to building alarm system. Heavy 0.032″ jacket for superior durability, Eight stranded conductors x 24 gage.